This article will help you understand and resolve the situation where you can't see your disk in Windows Explorer. This can occur particularly if a clone or restore operation is interrupted or fails. Disk: This is a physical device attached to your computer, typically via a SATA or USB cable. 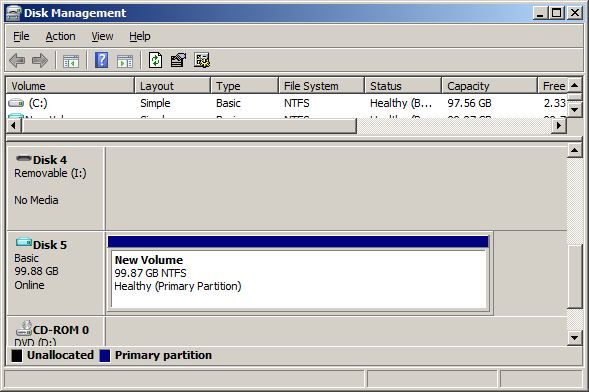 Partition: A disk is subdivided into one or more partitions. At the start of a disk resides a partition table that stores the location of these partitions. There are two standards, MBR and GPT. Filesystem: To enable Windows to manage the space defined by a partition, a filesystem is created. This process is called formatting. The two most common standards are FAT32 and NTFS. Drive / Volume: To utilise this space, Windows will typically assign a letter, at which point it will become visible in the windows explorer. There may be multiple Volumes on one disk. Or volumes can be split across multiple disks when RAID or dynamic volumes are employed. Drive letters can also be assigned to network attached volumes, but this is outside the scope of this article. To manage disks and drives/volumes. there are two tools, shipped with all editions of Windows, diskpart (command line) and Disk Management Console (Gui). They are both equally capable. For the purposes of this article, we shall use the Disk Management Console. For Windows 8: Press the 'Windows key', type diskmgmt.msc and press Enter. The window is split into 2 parts, the upper concerns volumes and the lower disks. To locate your missing device. Scroll down the list of disks in the lower pane. Usually, the disk size is a good way to identify your missing disk. 1. It is Online. It may be Offline for various reasons such as a fault or a signature clash. 2. Does it have a partition table? If not, it will be labeled "Not initialized". To create a partition table, right click on the left column, and select initialize disk. 3. Does it contain any partitions? If not, the disk view will show the whole space as unallocated. You can create one by right clicking on the disk view and selecting "New Simple Volume". 4. Do the partitions contain valid filesystems. If not, they will be marked RAW. To resolve, right click and chose format. 5. Do the partitions have assigned drive letters? If not, they still wont be visible in windows explorer. To resolve, right click and Select "Change Drive Letter and paths". Once you have assigned a drive letter, it will become visible in windows explorer. Note: There are one (or 2 in the case of EFI booting systems) small partitions (~100MB) on a windows 7 and later system disk. Do not assign drive letter to these partitions.